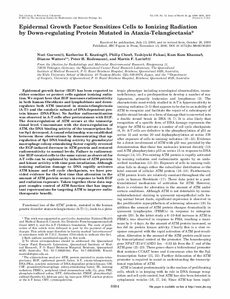 Copyright 2001 The American Society for Biochemistry and Molecular Biology, Inc.
Epidermal growth factor (EGF) has been reported to either sensitize or protect cells against ionizing radiation. We report here that EGF increases radiosensitivity in both human fibroblasts and lymphoblasts and down-regulates both ATM (mutated in ataxia-telangiectasia (A-T)) and the catalytic subunit of DNA-dependent protein kinase (DNA-PKcs). No further radiosensitization was observed in A-T cells after pretreatment with EGF. The down-regulation of ATM occurs at the transcriptional level. Concomitant with the down-regulation of ATM, the DNA binding activity of the transcription factor Sp1 decreased. A causal relationship was established between these observations by demonstrating that upregulation of Sp1 DNA binding activity by granulocyte/ macrophage colony-stimulating factor rapidly reversed the EGF-induced decrease in ATM protein and restored radiosensitivity to normal levels. Failure to radiosensitize EGF-treated cells to the same extent as observed for A-T cells can be explained by induction of ATM protein and kinase activity with time post-irradiation. Although ionizing radiation damage to DNA rapidly activates ATM kinase and cell cycle checkpoints, we have provided evidence for the first time that alteration in the amount of ATM protein occurs in response to both EGF and radiation exposure. Taken together these data support complex control of ATM function that has important repercussions for targeting ATM to improve radiotherapeutic benefit.